© Royal College of Physicians. Detail from Nevrologie by Ludwik Hirschfeld (dissection) and Jean-Baptiste Léveillé (drawings). The history of medical illustration in Western Europe tells two intertwined stories of ever-improving technique and understanding. The first is that of anatomy and doctors’ growing knowledge of how the body works and why sometimes it doesn’t – a knowledge gained through the practice of dissection, and recording what they learned in illustrated textbooks in collaboration with artists. The second is the story of printing and how technological developments enabled more detailed and accurate representations of flesh, bone and systems – allowing artists to use a broader range of techniques and the creation of books that better explain the body to the reader. Greater understanding provided by one doctor and artist leads to further research and representation by others – a repeating cycle that gains momentum with every medical and printing breakthrough. “There are moments of disjuncture in the history [of medical illustration] where you see changes from black-and-white printing to colour,” says Katie Birkwood, as she shows me around the Under the skin: illustrating the human body exhibition at the Royal College of Physicians in London, which charts the history of anatomical illustration from 1543 to the present day. “You see developments when things move from wood block illustrations [above] to copper plate illustrations [below], where you get a lot more detail." Katie is the rare books librarian at the RCP, and has curated the exhibition based on the College’s extensive archive of books and other media, which it has collected since it was founded in 1518 – though it lost a lot of its library during the Great Fire of London in 1666. 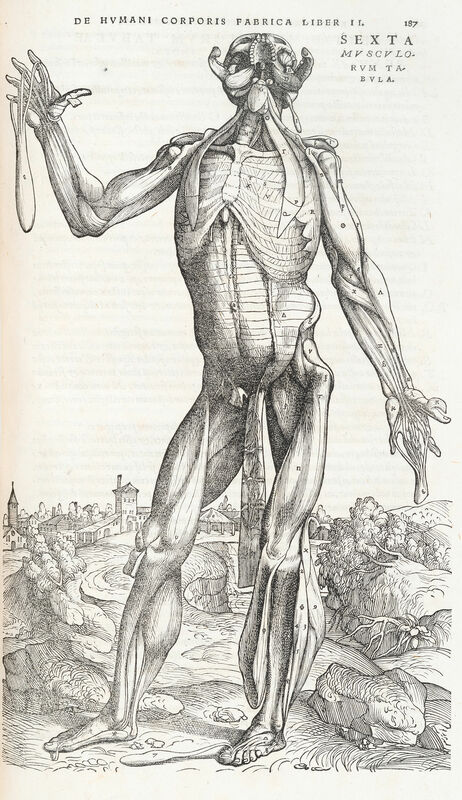 Iconic historical anatomical textbooks are most associated with the physician doing the dissection – Vesalius (below), Blasius or Gray – but the illustrators involved are just as important to their creation. © Royal College of Physicians. 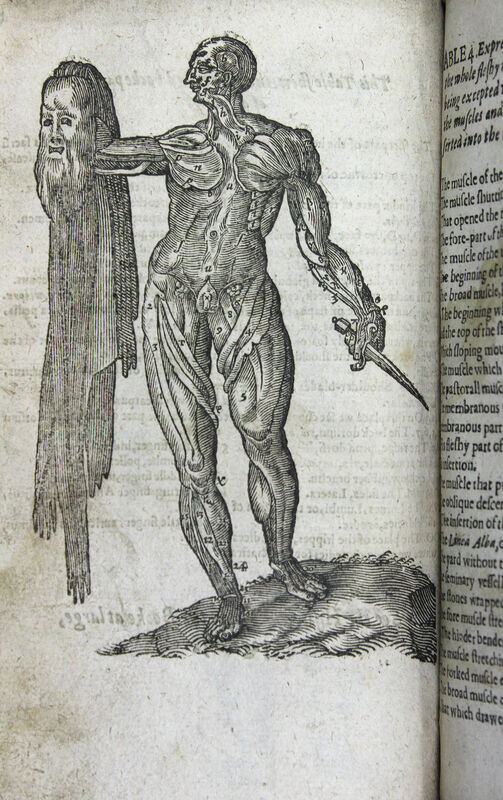 Andreas Vesalius’ De humani corporis fabrica libri septem, which was published in Basel in 1543, with illustrations like the one shown here attributed to Jan Stephan van Calcar). “These are really close collaborative projects,” says Katie “We often tend to think that collaborative working as new – a very 21st century thing – and that's nonsense." The illustrators of such books would have experience of working alongside dissectors, and would have built up medical knowledge that enabled them to better represent what the dissector wanted to show. In early medical textbooks from the 15th century to Victorian times, medical illustrations usually look less like the photorealistic or diagrammatic works you see in modern textbooks, and more like the art of the periods, drawing on religious imagery and symbolism. 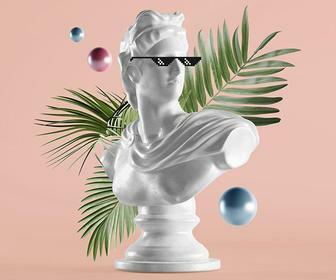 The reason for this isn’t that artists were making conscious choices to replicate what was going on in ‘fine art’ – but to them, that’s what art was. It’s not until much later that you see medical illustration diverge into something that we think of as clinical or scientific. “The earliest item we have in the exhibition is this book here,” says Katie, pointing to a 15th century book about bloodletting. 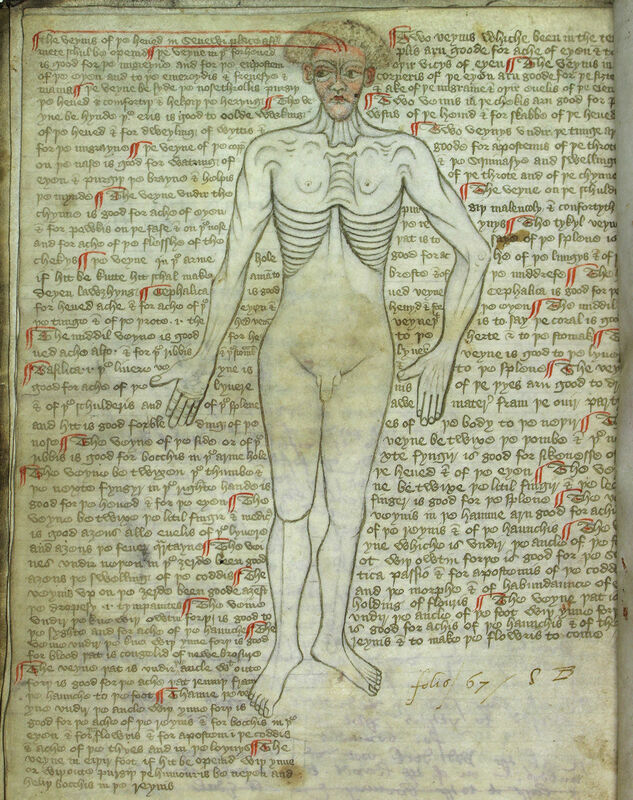 “It's a hand-written manuscript [with] a very medieval depiction of the body. It's a very stylised image – it has more in common perhaps with a depiction of Christ on the Cross, than it does with something you expect to be medical. "in this picture here, there’s a person who's flaying themselves – revealing their body to us – surrounded by what's effectively a halo. It's like a saintly body, or a look at the greatness of creation as manifest in this body." 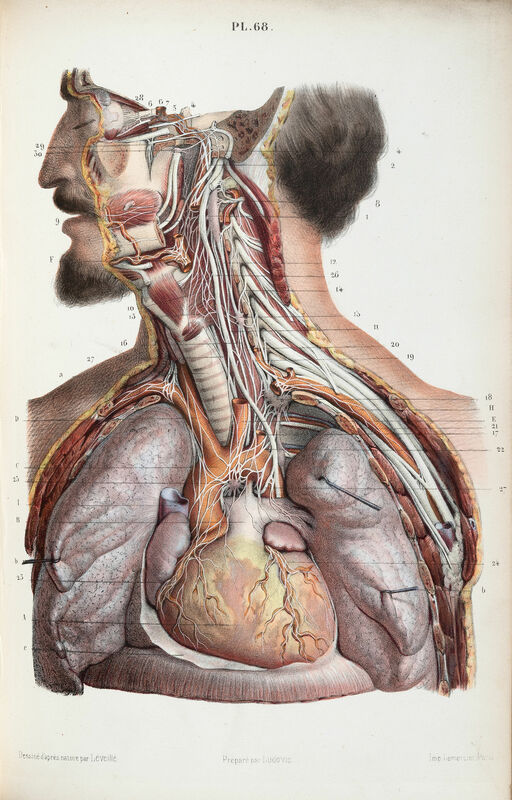 The beginning of the 19th century saw the introduction of lithographic printing, which lead to what Katie considers to the golden age of anatomical illustration – when illustrations were both artistic and informative, before the need for clinical accuracy limited the space for artistic expression. "This is a spectacular image,” she says. “It's lithographically printed in black ink and then coloured by hand in a really broad range of colours, which gives this photorealistic quality with an amazing play of light. One of the most difficult things to represent in medical illustration is that you’re using a 2D medium to show a three-dimensional collection of parts and systems. 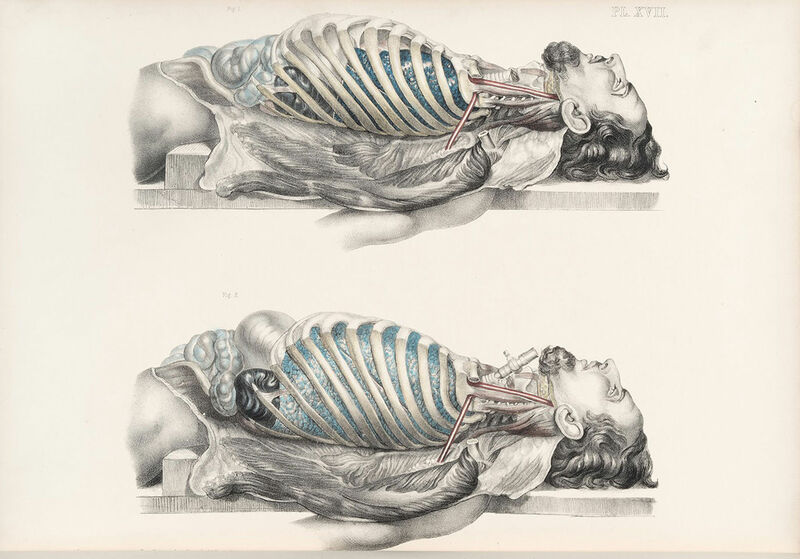 With this is mind, it’s perhaps surprising that there aren’t more series of images like this by Francis Sibson some time between 1840 and 1860, which shows the different positions of the ribs and organs when the lungs are deflated and inflated. “This shows some of the limitations of anatomical illustration,” says Katie, "because we have to have two pictures here to show the differing positions of the lungs and the internal organs. The cadaver has been tracheotomised – it's had a tube put in its throat and then air blown down the tube to inflate the lungs. It's a reminder that any one picture we see is a static picture of what is after all a moving body. Katie notes that this singular view of the human body in a single state caused issues for doctors when radiology using X-rays became widespread during the 20th century. Doctors found organs much lower than they expected them to be – and often thought there was something wrong with patients – but all ways, in fact, fine. The organs appeared lower as the patient were standing when the X-rays were taken – so their organs sagged down – while doctors were used to humans laying down for surgery or dissection, or in medical illustrations. Not all works selected by Katie from the College’s archive were aimed to educate – some were just trying to shock. 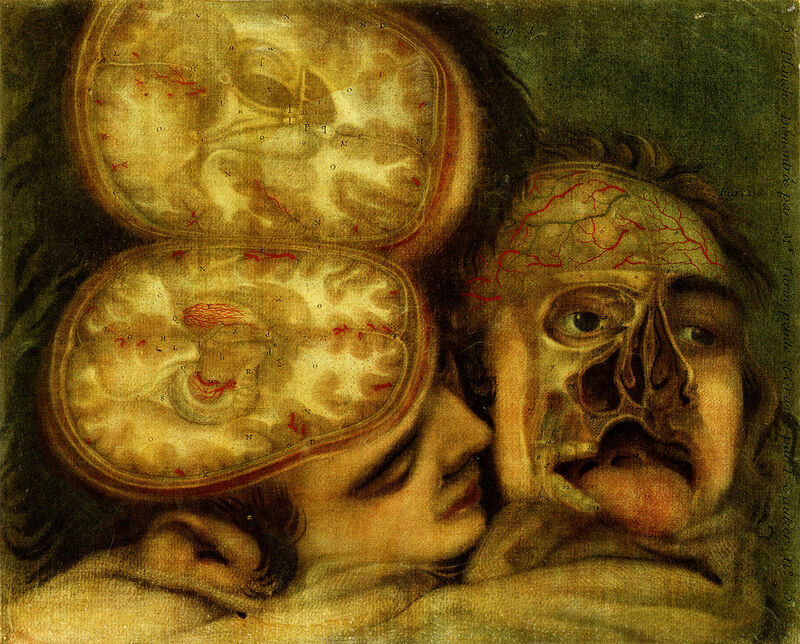 This grotesque image shows two heads opened to show the brains – one also missing its nose, perhaps due to syphilis. It's from 1748's Anatomie de la tête. Dissection for this book was performed by Pierre Tarin, with drawing and engraving by Jacques Fabien Gautier d'Agoty. Despite its creepiness, it is an example of real innovation. It’s one of the earliest examples of a four-colour print process, rather than hand-coloured black-and-white prints. Jacques invented the print process it uses – or may have stolen it from engraver Jacob Christoph Le Blon, to whom Jacques was an apprentice to previously. The process uses mezzotint on each of four plates of black, red, yellow and blue – rather than the cyan, magenta, yellow and black used in much modern large-scale printing. 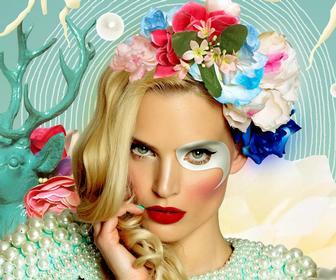 You end up with a dark, intense look that really heightens the effect of what's an already shocking image. Instead, the book was designed to be enjoyed as a curiosity. These books had appeal as the audience for medical textbooks before the 20th Century was broader than just medical professionals – it was common for gentleman to have such books as part of having a wide general knowledge. The book also existed to promote the print process to potential customers. You can see more of Jacques prints using this technique in this online reproduction of his 1759 work Anatomical exposure of the structure of the human body. Seeing over 500 years of anatomical illustration laid out across an exhibition, one question instantly comes to mind. Where are the women? They’re missing, of course, due to the patriarchy. "The standard is to show the male body,” says Katie, "and often they're quite identifiably male. You only show the female body if you want to show the reproductive system – and that was studied much less well until the 18th century when male physicians realised that they could make a lot of money by becoming midwives and starting to deliver the babies of the rich and famous. 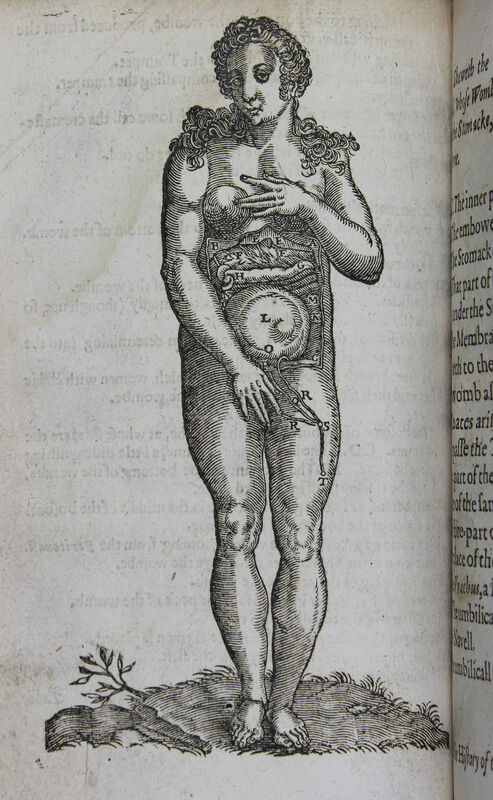 Illustrating women’s naked bodies – even partially dissected ones – could also considered lewd. But there was also an issue of there being fewer female bodies available for dissection. Most bodies were convicted criminals or victims of violence or accident that weren’t claimed by their families – and it was easier for a man to claim his wife’s body than vice-versa. Through the 20th century, the ability to increasingly cheaply print books with photographic plates has lead to medical illustration becoming more focussed on the explanatory and diagrammatic. 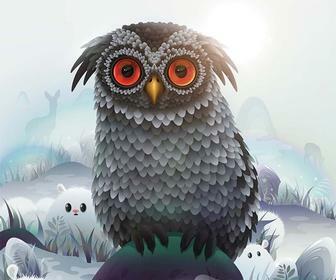 But these still suffer from the same limitations as the older illustrations – they exist only in 2D space. Through apps and AR/VR experiences, physicians can see parts of the body and the systems that flow between them from every angle – gaining a much better perspective (literally) on how we work. And until we can create a working 3D model of a human by scanning a person inside and out, this will be need to be sculpted by an artist. So perhaps the days of works that are as much art as diagrams aren’t quite over yet. Under the skin: illustrating the human body returns to the Royal College of Physicians in the Autumn.